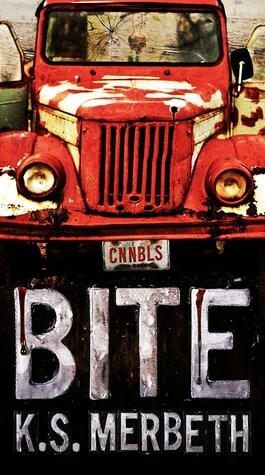 Bite, K. S. Merbeth’s entertaining debut, shines like the bright star it is as we follow a ragtag group of misfits with no sense of self-preservation and an unholy love of violence. Fans of post-apocalyptic movies like Mad Max will find plenty to love in this bloody debut. If you are bothered by severed body parts, you should perhaps skip this one, but if you are one of those readers who like to see their characters swimming in blood, this is an excellent choice for you. 16-year-old Kid accepts a ride from a strange-looking pair, knowing full well that she might not make it to the other side alive. The two are obviously up to something, but Kid doesn’t really care that much. She wants to be with someone for a change instead of wandering the wasteland alone. Wolfe and Dolly are soon joined by the rest of their people and Kid somehow ends up on the run with them. The fact that they are sharks (killers and cannibals) doesn’t matter much to our Kid. When they start saving her life and she starts saving theirs, she realizes she’s finally found a place to fully belong. Bite is a bloody odyssey that follows the adventures of a cannibalistic crew in a world that’s long been dead. If you think you could never sympathize with killers and cannibals, think again. Merbeth makes them practically irresistible in no time at all, making us root for them as they jump from one crazy, impossible plan to the next. None of the characters in Kid’s gang – Wolf, Dolly, Pretty Boy, Tank or Kid herself – have any sort of history that can be shared, but Merbeth still does an excellent job with their characterization. The point is to have five people with no pasts and no names and give them enough personality to be impressive. The strength lies in their relationships (none of them romantic) and their odd sense of loyalty in a world that doesn’t tolerate kindness or kinship. They may be a group of psychos who loot and kill whenever they get a chance, but they are still human, with real feelings and friendships. The nuclear wasteland provides a fabulous backdrop for this bloody, insane story. Wolf and his people make ludicrous plans with almost no chance of success, they set their eyes on a target (usually guns or food) and go off half-cocked and they still come out on top. Wolf himself is selfish, suicidal and often cruel, and he loves his grenades, but his occasional moments of chivalry and his odd sense of loyalty override his messed up personality. This story is not for the squeamish or the faint-hearted, but if you enjoy stories with plenty of dark humor, unforgettable characters and a whole lot of blood and gore, this is an excellent choice for you. It’s certainly the most fun I’ve had in ages. I am not sure I can handle this one. I am really squeamish when it comes to cannibals! Thanks for the warning. Cannibals? I don't think I can handle that. You're brave! Ooo something completely different, I like that about this one. It is nice to see something out there once in a while. I love when an author can make you like rather dispicable characters. Sounds like one hell of a story. It sounds like a really gory book. I like my books more on the fluffy side, so I'm not sure it's for me, but I'm glad you liked this book, Maja. It definitely sounds like it's entertaining in every way! "but if you are one of those readers who like to see their characters swimming in blood, this is an excellent choice for you." Whoa, this one is definitely not for me - I like all body parts attached, thanks. Did you say cannibalistic crew && nuclear wasteland? Now you have my attention. I'm really up for anything post-apocalyptic. I'm really considering this book now. Great review! On one hand, the post-apocalyptic nature appeals to me, on the other (detached) hand, I am not so fond of the horror elements. Sounds like an exciting, entertaining nevertheless! I don't think I'm squeamish or faint-hearted but it sounds like this is the book to prove me wrong! This sounds like so much fun and I especially love the focus on strong relationships, especially when they're not romantic ones. Wonderful review, Maja--I wouldn't have given this another look had it not been for your review. I'll definitely need to add it to my TBR! I'm not overly squeamish and this one sounds like a debut I had completely missed so I think I'm totally giving this one a try! Thank you for putting it on my radar, Maja!